Attract attention to your book and to your name. 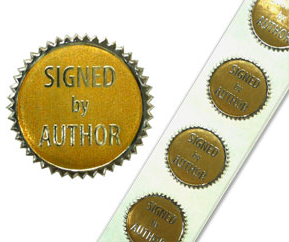 Everybody likes the personal touch and Signed by Author stickers let your reader (or potential reader!) know that they're getting that extra value. Pre-printed adhesive foil stickers, gold background/silver stamped. While minimum orders do apply, custom stickers tailored for your particular book launch are certainly available. Please inquire as to your needs and we'll be happy to obtain a custom quote and timeline for you.